There are three Game Reserve areas within the site: “North slopes of Mt. 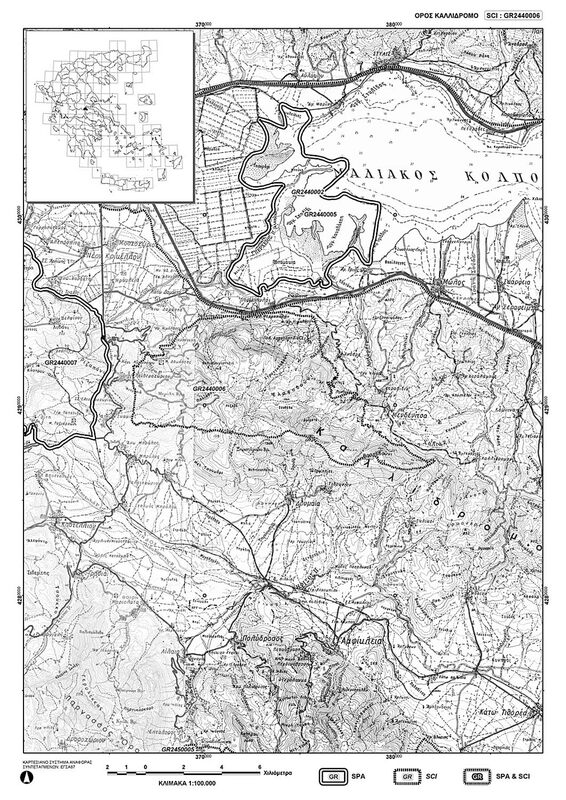 Kallidromo” (2,000 ha); “Arnofolia- Kryoneri (1,050 ha)”; and “Platania” (3,500 ha). 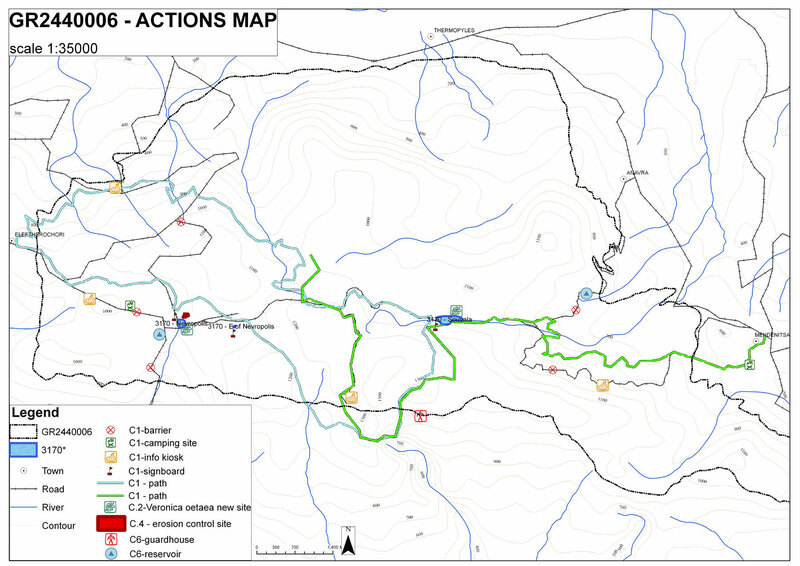 The project area is included in the Public Forest Complex of Mt. Kallidromo. Within the public forest there are areas of private ownership. The land uses in the public forest complex follow the 10-year forestry management plans issued by the Forestry Authority of Lamia. The forests are classified in management classes and used mainly for timber production. Certain areas are provided to the local farmers for grazing. 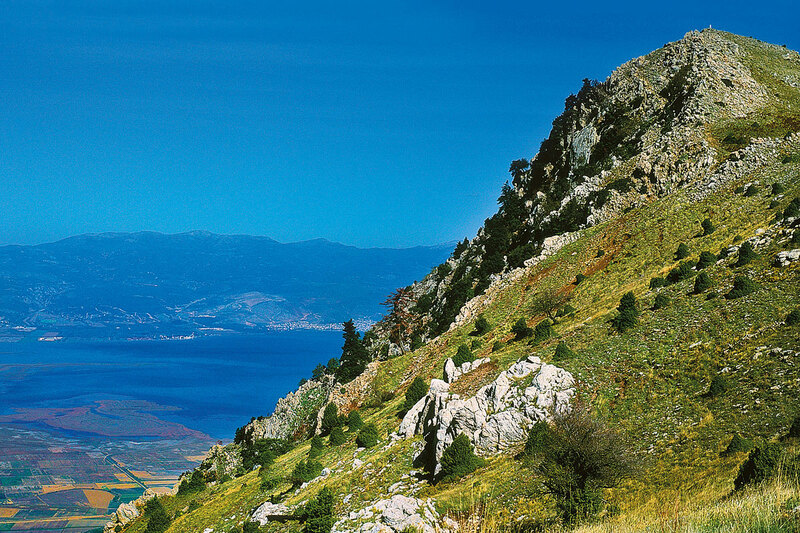 The site “Oros Kallidromo” extends at altitudes of 43–1,393 metres and includes the western part of Mt. Kallidrono and all of the highest peaks. The parent rock material of a large part of the site is limestone, but there are also large areas of flysch. The site includes several streams which are tributaries of Spercheios river. The flora, fauna and vegetation of the site have not been studied in detail; however the information available in the Standard Data Form of the site has been enriched by recent unpublished data, indicating a higher importance of the site. Mediterranean matorral, phrygana and tall maquis formations develop mainly at the lower slopes of the mountain. The phrygana (habitat type 5420), covering approximately 2,206 ha, are characterised by Cistus spp., Corydothymus capitatus, and Salvia fruticosa. Quercus ilex arborescent matorral and forest (habitat type 9340), covering approximately 1,000 ha, extend over several parts of the site, especially on north-facing slopes. Their understorey is characterised by shrubs such as the Rhus cotinus, Acer spp., Pistacia terebinthus and by typical maquis shrubs such as Quercus coccifera and Pistacia lentiscus. Quercus coccifera dominates the maquis at drier areas. Quercus pubescens also forms pure stands at places. Oriental plane (Platanus orientalis) riparian woods (habitat type 92C0) exist at several sites such as the ravines over Mendenitsa village, covering approximately 33 ha. A large part of the site is covered by conifer forest ecosystems. At the lower altitudes there are natural Aleppo Pine (Pinus halepensis) forests (habitat type 9540), covering approximately 69 ha. At higher altitudes there are mostly pure forests of Pinus nigra (habitat type 9536), covering approximately 3,075 ha, and Abies cephalonica (approximately 2,000 ha) but also mixed forests (approximately 200 ha). Typical species in the fir forests include Helleborus cyclophyllus, Doronicum orientale, and Cephalanthera rubra, as well as Juniperus oxycedrus and the rather rare in Greece Ilex aquifolium. The oaks occasionally participate in the understorey, and various transitional zones with mixed conifer and oak forest stands occur. Juniperus oxycedrus is also dominant in arborescent matorral (habitat type 5210, c 67 ha) at the lower margins of the fir forest zone. Dry and wet mountain grasslands develop at forest openings, at altitudes of 970–1,100 m, on limestone and flysch. The dry grasslands on limestone (habitat type 6210*) are characterised by a variety of forbs and grasses such as Festuca spp., Trifolium spp., Crocus spp., Colchicum spp., Viola spp. and several orchid species. The damp grasslands are characterised by species such as Galium palustre, Juncus spp., and Oenanthe silaifolia. There are two large, natural temporary ponds at altitudes of 1,000–1,100 m: the larger one at Souvala and a smaller one at Nevropolis. Typical vernal pool vegetation (habitat type 3170*) develops there, with species such as Myosurus minimus, Polygonum aviculare, Juncus bufonius, Ranunculus lateriflorus, Gnaphalium uliginosum, Mentha cervina, and Isoetes heldreichii. On bare limestone rocks, such as at Saroma, Kastraki, Psarou, Elafovouni, and Vrachovouni, chasmophytic vegetation develops, typically including Campanula rupestris, Sedum sp., and Umbilicus rupestris (habitat type 8210, covering approximately 100 ha), as well as scree vegetation (habitat type 8140, covering approximately 100 ha). The flora of the site includes a large number of species (over 600), but the list is not complete. Data on the fauna of the site are scarce, too. It hosts more than 30 bird species, at least 6 mammal species, 9 reptile species, and 7 amphibian species. In the greater area of Mt. Kallidromo there are several archaeological and cultural sites. A historical monument, the Monastery of Damasta, is located within the site. A most important element of the natural environment of this site is the presence of large areas of well-conserved habitats with a low disturbance level. At landscape level, the importance of the site is enhanced since it is connected to the broader ecosystem of Spercheios River (SCI GR2440002 and SPA GR2440005) and to the ecosystems of Mt. Oiti (SCI GR2440004 and SPA GR240007). The lack of detailed data hinders the fair evaluation of the importance of the site. Habitats: A total of 14 habitat types of Annex I Dir. 92/43/EEC have been recorded in the site, 3 of them priority ones (3170*, 6210*, 9530*). The Mediterranean temporary ponds (3170*) are extremely important at regional and national level. For a full description of the importance of the temporary ponds at high altitudes in Central Greece, please refer to the description of the site GR2440004. Flora: At least 15 endemic Greek taxa have been recorded in the site, two of them (Onosma stridii, Polygonum papillosum) endemic to a narrow area of Sterea Ellada. There is also a large number of Balkan endemics, including the rare Haplophyllum coronatum. In addition, the site hosts one plant, Ruscus aculeatus, included in Annex V Dir. 92/43/EEC 26 and orchid taxa protected by the CITES. Bird Fauna: The site hosts 7 Annex I Dir. 79/409/EEC bird species (1 resident and 6 breeding) and at least 16 migratory bird species. The fact that there are many old pine and fir trees increases the value of the site for woodpecker species. Mammal fauna: The site hosts 3 species threatened in Greece and protected by the Bern Convention (Annex II). One species, the Wolf, is included in Annex II Dir. 92/43/EEC. Amphibian and Reptile fauna: The site hosts 17 species protected by the Bern Convention (Annex II). Three species, the Yellow-bellied Toad, the Mediterranean Spur-thighed Tortoise, and the Hermann’s Tortoise are included in Annex II Dir. 92/43/EEC. Invertebrate fauna: The site hosts one species, Saturnia pyri, classified as rare in Europe.